China is the largest buyer of the seaborne traded manganese ore. It consumes around 80% of the total traded product. Since, most of the manganese ore produced worldwide goes to China, it is important to watch this market closely. A sneak peek into latest customs data maintained by SteelMint, reveals that in the first half of 2018 manganese ore imports to China noticed an increment of 15% Y-o-Y as supply bounced back and Chinese consumption continued to grow. China imported close to 12.3 MnT manganese ore during Jan-June, 2018 against 10.6 MnT during the same period in 2017. Imports from South Africa – the world’s largest manganese ore producer – recorded an increase of 6.7% on a Y-o-Y basis in H1 CY18 reaching 5.1 MnT. Over the past few years the major importer of South African manganese ore has been China followed by India. The two countries are the world’s leading Manganese Alloys producing nations. What was driving Chinese imports? 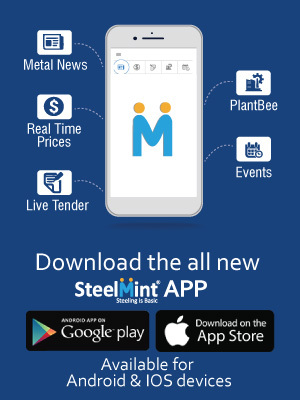 After the winter production cuts were lifted on 15 Mar’18, steel mills in China increased their steel production resulting in increased demand and subsequent rise of import prices of manganese ore. At the same time the appreciating Yuan against the US dollar supported the rise of the dollar-denominated import prices. The regular production restrictions in China has been leading to higher steel prices and margins, which may have probably encouraged traders to take long positions. Manganese ore prices increased significantly especially towards the end of Feb’18 and continued till Mar’18 due to good profits at Chinese ports and expectations of better demand after the Chinese New Year, which ended in the last week of Feb’18. This rise in manganese ore prices governed by the Chinese steel market sentiment forced Indian buyers to stay away from imports of the commodity as they were not able to earn an adequate margin based on prevailing Ore costs and manganese alloy prices. Also, Indian manufacturers chose to source the commodity domestically because of the depreciating Rupee. Additionally, in the event of robust demand from China, global manganese ore miners usually look to divert all their supplies to China, as Chinese manufacturers usually buy their requirements in huge quantities. 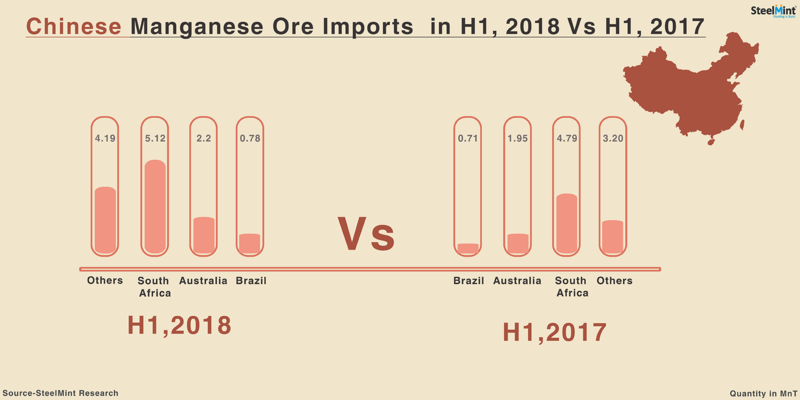 According to industry sources, Chinese imports of Manganese ore in May and June this year were also very high and India no longer balanced the market. As a result, all the surplus ore went to China as no other country compensates for the lack of Indian buying. Will the Chinese momentum continue? The metal companies reported positive results for the first half of 2018, helped in part by a sharp rise in prices. Although the market is concerned over the potential impact of the worsening China-US trade relations. At present, manganese ore stocks at the major Chinese ports have gone up to 2.80-3.05 MnT on 25 July compared to 2.70-2.75 MnT on 11 July, marking the first time in 13 months that stocks have exceeded 3 MnT. In early January this year, stocks were just 1.65-1.70 MnT. However, the stock build up at Chinese ports has now started to negatively impact prices over the past couple of weeks after material shipped from South Africa in May and June arrived in China.